With every step you take, you’re using energy to produce more energy – some of which is absorbed or dissipated, but what if you could harness the movement of every step and use it to charge your cell phone? That’s exactly what researchers at Georgia Tech is doing. 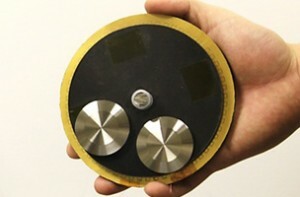 The team led by Zhong Lin Wang have developed 4″ charging disk that’s capable of charging smartphones 50 times more efficient than generators of the same dimensions. The small charging devices uses metallic disks that vibrates with the wearer’s steps. The vibration causes electric current to flow through the disks, generating electrical charges. If you’ve ever gotten static electricity from walking on carpet, you’ll understand the principle behind the device. While the chargers are not consumer ready, we hope it’s more prolific than those sustainable dance floors that provides nightclub lights or exercise equipment that charges coffee shops. You can read a full abstract about the research here.